This Los Angeles baby photography session was also perfect timing because mom was starting to think about getting him an agent. It seemed that everywhere she went, people were telling her he should be a baby model! We agreed completely- just look at him! Soon after we finished this baby photography session in Los Angeles, mom submitted his photos to two very well known agencies. Both agencies responded back almost immediately that they wanted to represent him! Within just a few days, he was off to a baby photo shoot for Disney! This week, he is up for a Gymboree shoot! Actually, many of our clients have gotten representation and work after submitting our photos to agents! These babies have gone on to work for Skip Hop, American Apparel, Infantino, and more. This smile totally melts your heart, doesn’t it! We tried this set up recently in another session. The colors and textures photographed so well, we had to try it again! The adorable knitted jumper is from Zara Kids is so perfect for this shot! The wood buttons add such a nice touch too. We caught him mid toe grab here! 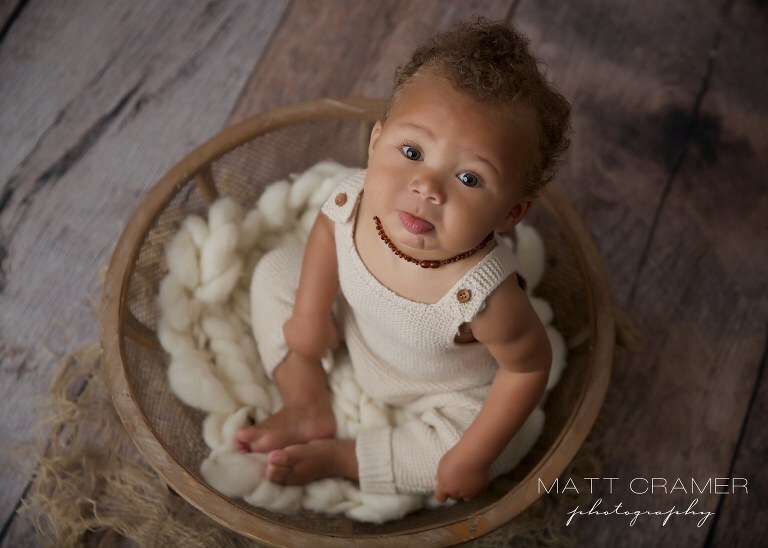 He was about eight months during this Los Angeles baby photography session. This is the age when they start to have the cutest expressions. They also love to grab their toes too! From the textured rug shot, we moved to our first prop shot. Sometimes babies don’t like to stay sitting in our baskets. But this little guy thought it was so much fun! The entire set up compliments his hair and skin tone too! This has got to be the cutest face ever! 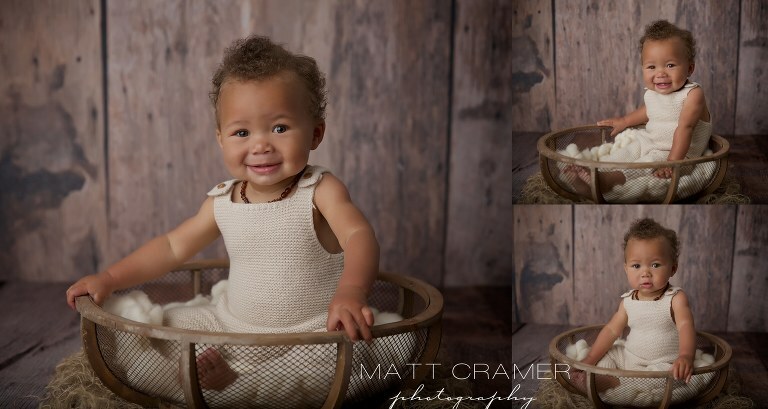 During our baby photography shoots in Los Angeles, we love to capture all angles. Shooting from above is always a great way to give parents another fun shot to choose from. Once we moved this sweet guy out of the basket, he was on the move! Crawling away from us at a fast pace was the best game ever! Grabbing his toes again! This baby was all smiles for us! His two little bottom teeth are too cute! This is one of our favorite shots from the entire Burbank baby photo session! He was having such a great time with us! 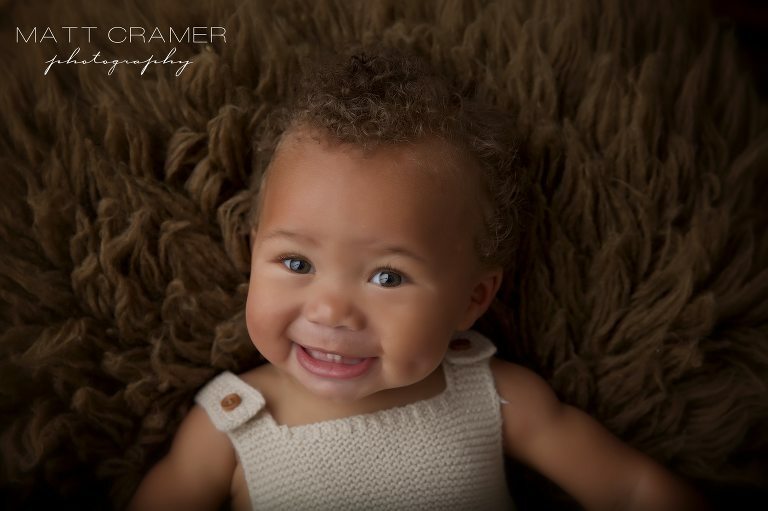 Not all babies will be this happy and smiley during their photography sessions with us and that is ok. We have photographed a 1000+ babies by now, and have seen it all. There are plenty of tricks up our sleeve to engage baby during our photography sessions. After a quick break, we switched to this lighter wood backdrop. 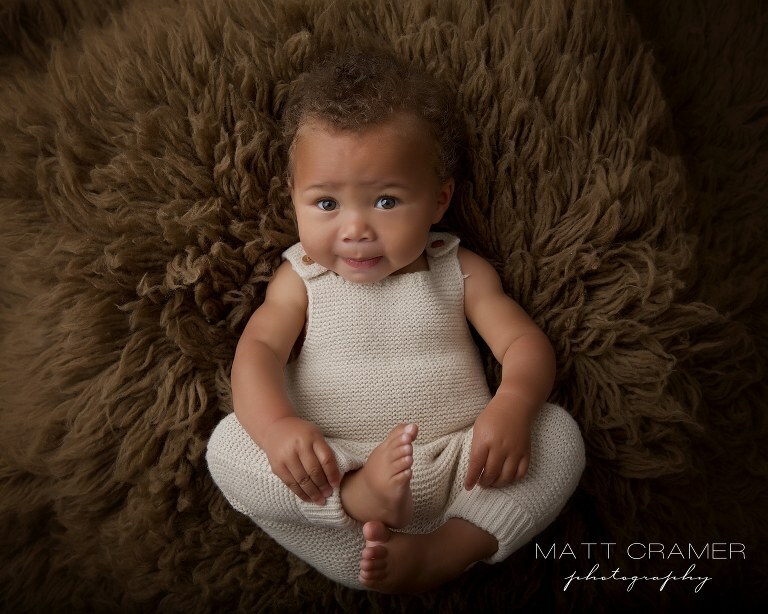 The grey outfit was custom made for our Los Angeles baby photography studio. It was purchased in three colors actually, because we loved it so much! The many faces of an eight month old! From smiley to serious…… and back to smiley! This image is another one of our absolute favorites from this baby photo session in Los Angeles. We added a custom handmade teddy bear to the set. The bear was actually made by Matt’s mom! Oh that face! The sweetest! Finally, at the end of our baby photo shoots, we like to finish with this shot. Parents love it! Sometimes, we can get baby to turn around and look over their shoulder. When this happens, it’s magic! Those dimples are just the icing on the cake! Every photo is perfect. Each one could be on the cover of a magazine! His personality is truly captured in every photo! !